Heat oven to 375°F. Place bread slices on ungreased cookie sheet. Drizzle 1 teaspoon oil over each bread slice. Mix tomato, basil, capers, salt and pepper. Spread half of the tomato mixture over bread slices; top each with cheese slice. Spread remaining tomato mixture over cheese. Prepare and refrigerate tomato topping up to 24 hours ahead. Assemble crostini for baking no longer than 1 hour ahead or the bread will get soggy. Capers are flower buds from the Mediterranean caper bush. These small buds are picked, dried in the sun and pickled in vinegar brine. 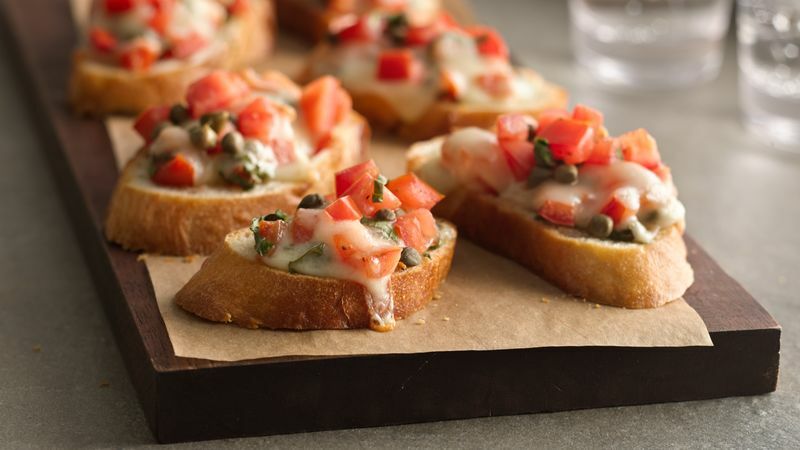 They make great additions to salads and appetizers, such as this crostini.